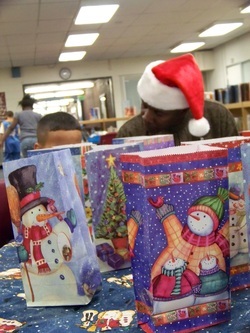 Giving Kids is a community-based charity organization with branches in the Pikes Peak region of Colorado and the Southwest coastal region of Florida that goes into selected elementary schools and provides children from low-income families the opportunity to select Christmas gifts for their family members at no cost to the schools or participants. To learn more about Giving Kids, click on the "About Giving Kids" tab. We will be supporting the love of giving for 300 students in four schools, bringing Giving Kids to elementary schools in Colorado Springs, Colorado and Naples, Florida. We have been blessed by amazing donors and sponsors, and a special thank you goes out to Minks Relocation Services again this year for another very generous sponsorship gift. Without partners like these, we could not do these events. If you need any real estate or property management help, check out this generous business at www.minksrelo.com. We also owe a debt of gratitude to our volunteers, and to the staff at the schools we serve. It takes a whole team to make this happen, and we appreciate all of you! Help us fill Giving Kids' gift bags. Nothing is as beautiful as the giving spirit with which all children are born, and which Giving Kids seeks to nurture. It's such a reward to see the glow on these kids' faces as they clutch their precious packages and begin to dream, as we all do, of the look on a loved one's face when they open that special gift on Christmas morning. Every donation counts - we stretch the dollars, so no amount is too little to make a difference in a child's life! For every six dollars you donate, a child who would not otherwise be able to do so, will be finding joy in giving gifts to the people they love. Now it's easier to donate than ever - simply click on the "Donate!" tab and you'll be taken to a secure payment site.